This new saw from Shane Skelton has caused a bit of a stir among tool aficionados. It's the first handmade bespoke saw to be produced in England for some years and Shane is single-handedly trying to revive the handmade saw tradition in this country. I was able to give it a brief test when he brought it to my stand at the North of England Woodworking & Power Tool Show. The handle was a little small for my oversize hands so he offered to carry out the adjustments as if it had been commissioned. That's what bespoke is all about! The blade is high carbon spring steel tapered along its length from 43mm at the heel to 37mm at the toe and 0.018in thick. It's heat treated to achieve 50-52rc and the teeth are individually punched using a fly press. The blade is fitted to a back milled from solid brass flat bar and the hand-shaped rosewood (Dalbergia retusa) handle is fitted to the blade with hand-turned split nut saw bolts. 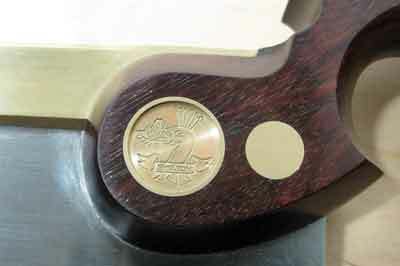 No premium saw would be complete without a medallion and the Skelton is hand stamped with the family crest logo. Based on a Georgian design, each saw is numbered and comes with a letter detailing its manufacture - this one is number 17 and is without a doubt a thing of beauty. Shane's skill and experience as a gunsmith is clearly evident in the attention to detail around the junction between the back and the handle, which following the adjustments, now fits my hand like a glove. During the first couple of strokes I found the saw tended to jump out of the cut. I am used to dovetail saws with finer teeth, 20tpi compared to 15tpi on the Skelton, but adjusting my technique to compensate has made a difference. Some would say 15tpi is quite coarse for a dovetail saw; however, I found the sharpness and the 0.076mm set per side of the Skelton gave a much easier action than my 20tpi Roberts & Lee. There can be a tendency to struggle on with a blunt saw when it's so difficult to sharpen the 20tpi, whereas the 15tpi encourages early sharpening. By the way, Shane offers a sharpening service for his saws. I tend to cut shy of the baseline on the reverse face to avoid over shooting. Using this saw with the back running in horizontal strokes, the tapered blade gives a cut just short of the baseline on that face. A slight adjustment and a couple of additional strokes means that with a little practice, you can get closer to the baseline without having to stop and look at the other side. Accuracy here means less time clearing the waste later. 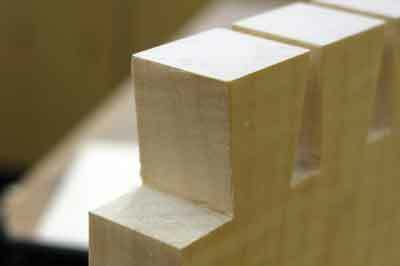 The sawn faces looked good with very few saw marks so there was no need to clean up with a chisel. I have never really been a great believer in spending a fortune on hand tools. I think the most I have spent on a tool is Â£140. Do expensive tools make you a better maker? I don't think so. 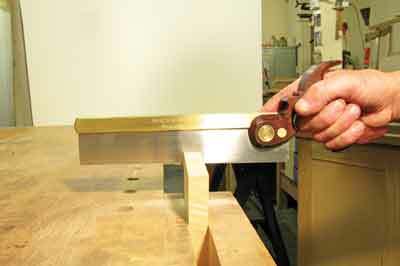 Spending on tools will not compensate for bad technique; however, using a tool that has been made with care and thought can give greater enjoyment in the work and reward good technique. This saw does everything required of it technically, but more than that, it comes easily to the hand and is responsive, making it a pleasure to use. If this review seems a little gushing, it's difficult not to be when presented with a tool this good.